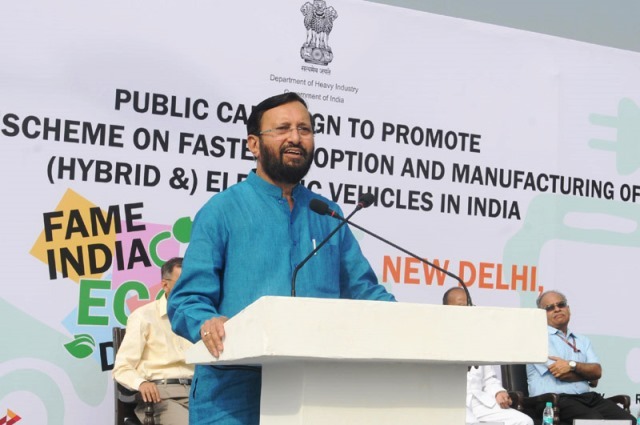 Environment Minister Prakash Javadekar at the launch of a public campaign to promote the National Scheme on Fast Adoption and Manufacturing of (Hybrid &) Electric Vehicles (FAME) on June 05, 2015. On the occasion of World Environment Day 2015, a rally of electric and hybrid vehicles of all categories was flagged off jointly by the Union Minister of Heavy Industries and Public Enterprises Shri Anant Geete and Minister of Environment & Forests Shri Prakash Javdekar from the India Gate lawns in New Delhi. The event was organized by Department of Heavy Industry with the sole objective of informing the public at large about the schemes of Faster Adoption and Manufacturing of (Hybrid &) Electric Vehicles (FAME India). The Scheme has been launched in order to protect the environment as it will help reduce the use of fossil fuel, which is one of the main sources of greenhouse gas (GHG) emissions from within the Transport sector. Speaking on the occasion Shri Anant Geete said the move to promote use of electric and hybrid vehicles is part of Prime Ministers Make in India Initiative. Initially, a subsidy of 30% will be given to buyers of such vehicles. It is expected that the phased replacement of fossil fuel based vehicles by these new generation vehicles will result in net saving of ₹14,000 crore. The Minister Shri Anant Geete appealed to the automobile manufacturers in the country to chip in this mega project for the success of indigenous efforts under the Make in India concept. He was also of the opinion that the future belongs to electric vehicles and we must welcome it. Environment Minister Shri Prakash Javdekar added to this and informed that the project is in tune with the country’s resolve of reducing the carbon emission to protect the environment of this universe as a whole. He also noted that the launch of this campaign will definitely strengthen Indian stand on this issue on the international platforms. Shri Javdekar also informed that for years, he has himself been using electric scooter for his local trips. About 25 owners of electric vehicles mainly of Mahindra Rewa took part in the rally. About 50, two wheelers were brought by various electric scooter manufacturers. Provision of test driving at India Gate for attracting people to use these vehicles was also made. At India Gate, A lucky draw for all participants was also held and winner of the contest Shri Arun Sharma from Karol Bagh, New Delhi was gifted with a electric Two-wheeler which was sponsored by Hero Electric. The rally culminated at T3 of Indira Gandhi International Airport, New Delhi. As in the case of India Gate Lawns, a lucky draw was also held for those arriving at the T3 terminal in which one Mr. Rahul, a resident of Saket area in South Delhi, became the lucky winner. He won a free electric two-wheeler from M/S Lohia, Manufacturer of Electric Vehicles. The key attraction of rally was the soft launch by Mahindra and Mahindra of its Sedan category vehicle (E-verito), which is the first four-door pure electric model in the country. It is noteworthy here that the FAME India scheme will focus on four key areas viz., technology development, demand creation, pilot projects and charging infrastructure. The Government of India has an ambitious target of penetration of 6-7 million electric and hybrid vehicles per year by 2020 resulting in the saving of fossil fuel worth Rs. 60,000 crore. This in turn will result in reduction of 2 million MT of C02 emissions per year. This scheme is also aligned with Make in India campaign and expected to create additional 3 lakh employment opportunities in the country.